Emulsifiers used in food are also known as emulgents. Among various emulsifiers, an egg is one of the oldest and most commonly used emulsifiers. Emulsifiers are finding large application in chocolate and confectionery products providing various advantages during processing and storage. The primary emulsifiers used in chocolate are PGPR and lecithin. However, new emulsifiers are also being introduced to enable oil and water to be combined in a stable state for a long period of time. The food industry is moving towards using lecithin in emulsions because the hydrophobic end dissolves both in oil and water. Hence, resulting emulsion to stay for a longer time. Moreover, lecithin also breaks down blood and dietary fats in small particles, helping in the weight loss. Increasing number of companies are moving towards producing natural and organic skin care products. This is resulting in the increasing use of natural emulsifiers for organic hair care and skin care formulations. Hence, companies are investing in the research and development to make natural emulsifiers. However, the biggest challenge faced by the companies is making emulsifier that remain stable for a long time, without oil and water splitting away. Companies are also introducing semi-synthetic emulsifiers developed from natural ingredients but undergo a process. Semi-synthetic emulsifiers have found to be non-toxic and work better than natural emulsifiers. According to the report by Persistence Market Research (PMR), the global emulsifiers market is expected to witness strong growth between 2017 and 2024. The global market for emulsifiers is also estimated to reach US$ 5,934.5 Million revenue by 2024 end. 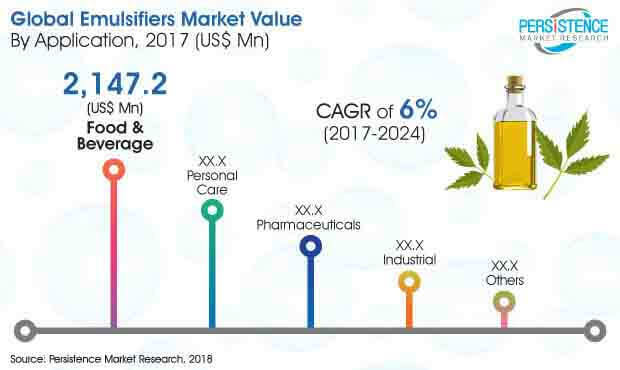 Compared to various industries such as pharmaceuticals, personal care, and others, emulsifiers are likely to find large application in food & beverage industry. In the food and beverage industry, emulsifiers are being widely used in bakery and confectionery products. Meanwhile, other products including dairy and frozen products, sauces and dressings, beverages, and meat and poultry. Increasing application in food products is leading companies to come up with the emulsifiers that can fight against fat content in various food products. Finding a clean label emulsifier has emerged as the biggest challenge. Still, the natural emulsifiers have not been found to be as effective as the synthetic emulsifiers. However, companies have found some natural alternatives to the synthetic emulsifiers such as chickpea flour, potato fiber, bamboo fiber, mustard flour, and peanut flour. However, most of these natural ingredients didn’t remain an emulsion after a certain period of time. Regulatory bodies across the globe have also introduced various regulations on the production and use of emulsifiers. Moreover, some of the countries have also made it mandatory to list the emulsifier on a food label. Modern food processing techniques are also resulting in the expansion of food production, influencing new food product development. New food products are being developed in segments such as dairy, bakery and processed food. This is also driving the demand for emulsifiers in the food industry. Europe, North America, and Asia Pacific are some of the regions witnessing growth in the emulsifiers market. Moreover, ongoing research on developing new emulsifiers for the food and personal care industry is also fueling the growth of the global market for emulsifiers.